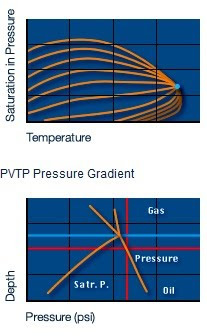 PVTP is a tool for the production or reservoir engineer to use to predict the effect of process conditions on the composition of hydrocarbon mixtures with accuracy and speed. The compositional behaviour of complex mixtures including gas mixtures, gas condensates, retrograde condensates, volatile oils and black oils can be interpreted and predicted with confidence. The PVT package can be used as a stand-alone analytical tool, or can be used to generate tables of fluid properties, reduced compositions or matched parameters (Tc, P, ω Volume Shift Parameters and Binary Interaction Coefficients) for other applications such as reservoir simulators, well analysis packages, up to production process simulator. A comprehensive set of standard options for Equation Of State modelling i.e.